My first visit to Paris was in 1966, but I only took a single film and dropped it complete with camera into the lake at Versailles - not a good start! Since then I've returned many times, for holidays, to take photographs and in several recent years for Paris Photo and Le Mois de la Photo. But whatever I've gone there for, I've always taken photos. My first published portfolio of work in a magazine in 1974 included several pictures of Paris from the previous summer, and in the mid-80s my second one-person show was 'Paris Revisited' and in part a homage to one of the great photographers of Paris, Eugene Atget, in whose footsteps I was at times very conscious of treading. The pictures for this were taken in 1984. 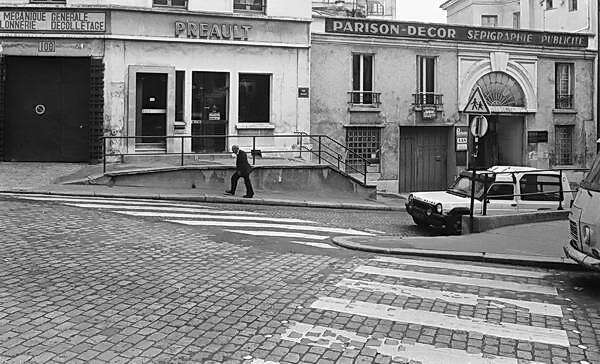 There is a considerably wider selection of the black and white pictures from this trip under 'Paris Revisted' on this site. On the same visit I also took some colour work which you can see here as 'Paris colour'. A few years later I returned and photographed more extensively in colour (now using colour negative film) both in the city and on its eastern edges - to be added soon to this site. I have also photographed the city on a series of visits in the 1990s and since, some work from which I hope to add at a later date. These include some panoramic pictures, particularly of La Défense. Linked at left are a large set of pictures taken with a DSLR during my stay in Paris for the Paris Photo in November 2006 and a set of pictures from the following November when I went there again in 2007 for Paris Photo. All pictures on this site are copyright © Peter Marshall, all rights reserved.